As a New Year begins, we are once again looking for forward to working with the village on a number of exciting community incentives. This website will be getting an update with a number of local news stories, details about our Cudworth community projects and the business listing has a number of local shops and services to be added soon. Then we want your help. We are putting together a Cudworth Community Calendar with pictures of our wonderful village. 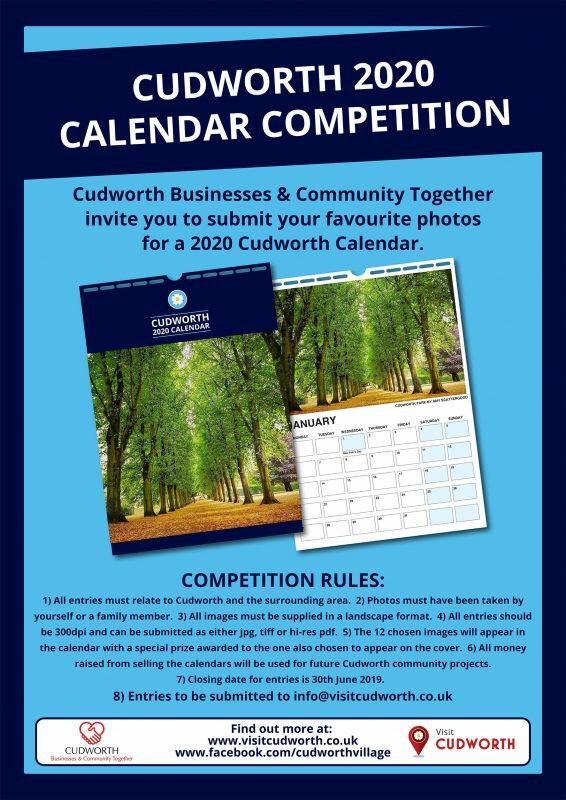 All the money raised from sales will go towards Cudworth community projects, meaning not only will you get a lovely calendar you’ll be helping the village too. What’s not to love? This means we need 12 fabulous photos of Cudworth to feature… so what are you waiting for, get snapping! Cudworth has some amazing sights and places to see: Cudworth Welfare Park, the Roman Bridge, the amazing stone face carvings, historic buildings that have stood the test of time and Carlton Marsh Nature Reserve, a nature lover’s delight. These are just a few of the landmarks in our wonderful village. Entries to be submitted to info@visitcudworth.co.uk before 30th June 2019. 1) All entries must relate to Cudworth and the surrounding area. 2) Photos must have been taken by yourself or a family member. 3) All images must be supplied in a landscape format. 4) All entries should be 300dpi and can be submitted as either jpg, tiff or hi-res pdf. 5) The 12 chosen images will appear in the calendar with a special prize awarded to the one also chosen to appear on the cover. 6) All money raised from selling the calendars will be used for future Cudworth community projects. 7) Closing date for entries is 30th June 2019.